Sen. Scott Brown, ranking member of the Senate Contracting Oversight Subcommittee, holds a hearing on mismanagement of contracts at Arlington National Cemetery, on Capitol Hill in Washington, D.C., July 29, 2010. 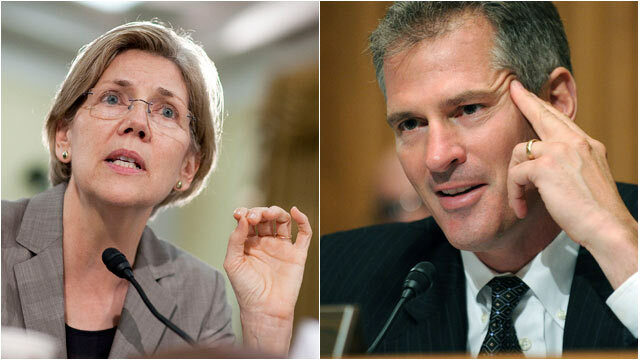 Sen. Scott Brown of Massachusetts put challenger Elizabeth Warren on the rack early during their debate Thursday night, assailing the Democrat for listing herself as "Native American" on law school documents early in her teaching career. "Elizabeth Warren said she was a Native American, a person of color," Brown said, gesturing toward Warren. "As you can see, she's not." The debate was the first in a series of four that will take place across the Bay State over the next 40 days. And with the latest polls showing a near-deadlock among likely voters, both candidates are counting on their performances, and the public's reaction, to swing the election their way. Brown, who replaced Ted Kennedy in the Senate after the "Liberal Lion" died in 2009, launched the attack on Warren's decision to file as a Native American on law school directories in response to the opening question from WBZ-TV moderator Jon Keller, who asked if the senator had questioned Warren's character during the campaign. Warren countered, saying that her mother was "part Delaware and part Cherokee" and that she never used her designation for professional gain. "I was going to start by saying Sen. Brown is a nice guy," she added, momentarily disquieted by the early onslaught. But then he called, as he would throughout the debate, for Warren to release personnel records he said would determine if she had won any undue professional success because of her "Native American" status. The candidates would trade jabs on everything from President Obama's defeated jobs bills (Brown voted against all three) to the Blunt Amendment, which would have granted employers the right to deny certain kinds of health care coverage if they cited "moral reasons." Brown co-sponsored the unsuccessful Republican-backed measure. Charged with submitting policy proposals that would run up the deficit, Warren was defiant. "I'm sorry," she said, "But these are made up numbers, Sen. Brown." Warren attempted to tie Brown to his more conservative Republican colleagues, noting that a GOP-controlled Senate could lead to Oklahoma Sen. James Inhofe, who calls climate change a "hoax," being allowed to run the committee that oversees the Environmental Protection Agency. Brown bristled at the suggestion, telling Warren, "You're not running against Jim Inhofe, you're running against me." There had been some speculation earlier in the day that Brown, who was in Washington, D.C., until late afternoon, would miss out on the debate to vote on a short-term spending bill. But Senate Majority Leader Harry Reid, D-Nev., postponed all business and accused Brown trying to find a reason not to return to Massachusetts. "I've been to a few of these rodeos," Reid said on the Senate floor. "It is obvious there is a big stall taking place. One of the senators who had a debate tonight doesn't want to debate. Well, he can't use the Senate as an excuse. There'll be no more votes today." Warren, who first gained public notoriety -- and liberal acclaim -- during her time heading a watchdog committee charged with pursuing accountability and transparency in the 2008 "TARP" bailouts, is considered by many Democrats to be the candidate most likely to unseat a Republican in this November's general election. Brown and Warren will meet for a second face-to-face Oct. 1 on the campus of the University of Massachusetts-Lowell. +Mass. GOP Mouse That Roars in 2012?